Leaving Macas, the landscape had changed: the common picture we have in mind when we think of jungle and Amazonas. The road meandered through the valley of Río Upano, past wooden shacks hidden in Banana plantations, a freshly bleeding dog dead on the tarmac, and in the afternoon a black wall of rain which catched me up 5km to Mendez. In the following days, until Loja, I should understand why the rainforest has its name. There is rain coming like a black wall and chasing you, there is malicious rain dropping suddenly out of the blue sky, there is sneaky rain, starting as mere increased humidity and when you notice it you are already wet, there is dumb rain being there when you start, going down like a curtain of strings until the evening, and there is intermittent rain catching you whenever you just wrapped up the raingear in the depths of the luggage. I had all of these in changing orders. After the bus excursion from Mendez to Cuenca (see there), I was eager to ride the bike again. It became a long day. The way oscillated up and down around 1000m altitude in a pure greenhouse („Gewächshaus“) climate. Sweating at 36º humid Celsius, but with nice views into the valley of Yungaza, I reached Limón for lunch and had an informative discussion with a kiosk owner about the mines nearby: time ago, his parents fished for gold in the local river, now great parts of the region are licensed to big chinese mining companies. For them, the government has tarmaced the sand tracks five years ago (and still large constructions!). I should see one of those mines after Zamora (see pictures above). With a long climb to Plan de Milagro and a steady descent, I accumulated 2270 height meters upwards, my new day record after Pasto, and reached the little town S.Juan Bosco in dawn. The next day involved again two stiff climbs to 1840m altitude each. On the 10km earth road after the dreary street village Tucumbatza in the middle of the forest, around a turn, two dogs attacked me. Of course, this happened before, and my normal procedure for barking and snatching dogs is to shout at them and to sprinkle them with water. The next step of escalation is to stop and get off the bike. This needs some overcoming but normally breaks the chasing pattern. Here it didn’t. I faced the approaching beasts baring their teeths. I kept shouting at them, barking myself, and took stones up from the ground which I threw at them from 1,5m distance. All instincts were concentrated in those moments of fight, eye in eye with the primeval nature. Since then, I always carry some stones at hand. In continued the next morning the short and flat way crossing the river Yucuambi to Zamora, where I spent one day in the national park Podocarpus (see there) before tackling the last stiff climb up to Loja at 2300m altitude. After an extended goodbye, I only left at 12.30 (in a rain of the dumb sort). The climb took no end. At 6.30 p.m., I was still struggling in the rain and mist at 2980m. What a miracle when out of night and darkness the lights of Loja appeared! After these 565km with 10.476 height meters climbing since Riobamba, I met there again Andy with the german cyclist Armin. 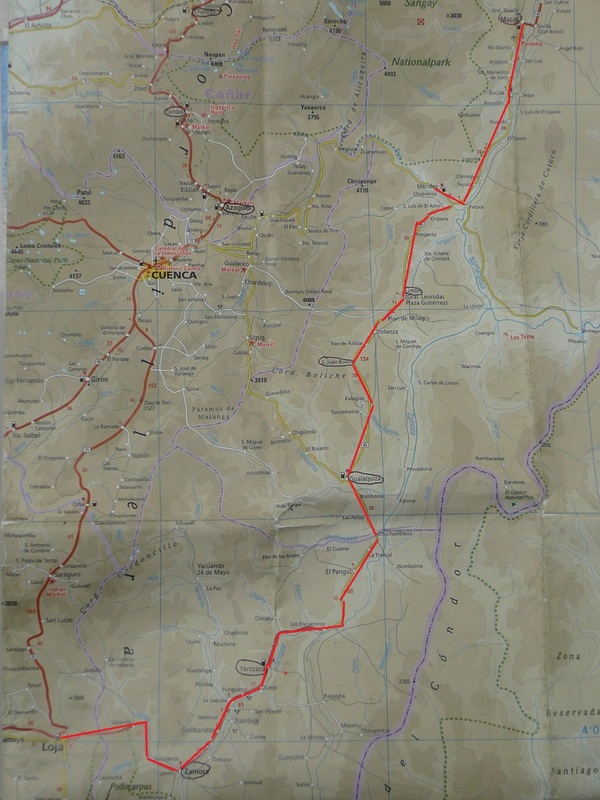 Andy, just before arriving Loja on the Panamericana, had a severe road accident and injured badly his shoulder. I admire him for his composure in this situation and wish him a fast recovery! Dieser Beitrag wurde unter Auf Englisch, Ecuador, Vivencias abgelegt am 1. August 2013 von skuttruf.